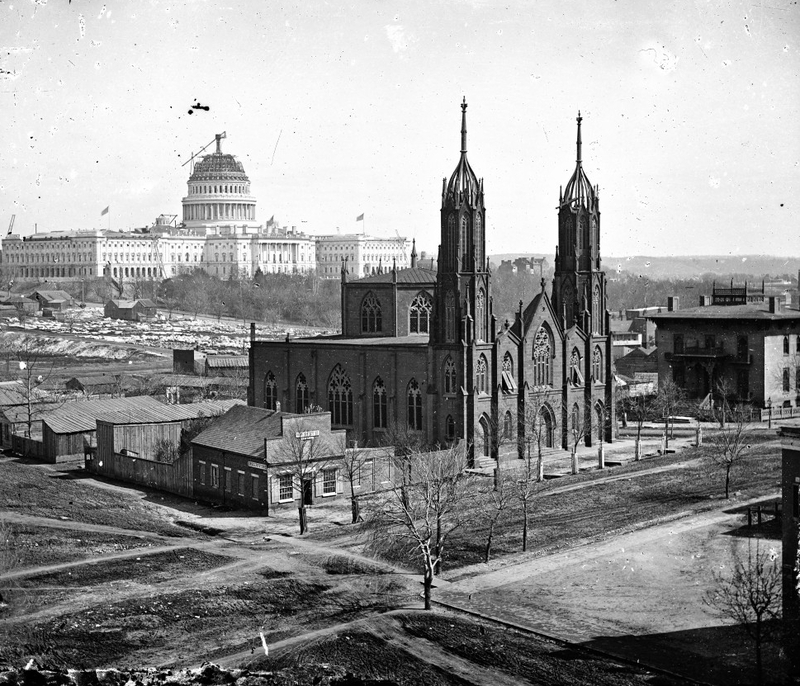 The photograph below is especially beautiful because it depicts a stunning James Renwick, Jr. spired church and in the distance shows the US Capitol building under construction. Construction on the Capitol began in the 1793 when President Washington helped lay the cornerstone and it was completed by the year 1800. The signature 'wedding cake style' dome, however, was added many years later in the 1850s. Look closely at the photograph and you can see the Capitol's dome surrounded in construction scaffolding and topped with a crane-like armature. The two buildings sit thoughtfully in the landscape. The James Renwick building was called the Trinity Episcopal Church and opened to the public in 1851. According to the Washington Post, when the Civil War broke out "the church was requisitioned for use as a hospital. A raised wooden floor was laid atop the pews and secured with nails. (The nail holes were forever visible.) Lincoln is said to have visited wounded soldiers." By the early 1920s, the church was converted to a mission to serve the impoverished and by 1936, "the Episcopal Diocese of Washington agreed to lease the 14,000-square-foot property to Auto City Parking for $50,000. On June 16, 1936, the last service was conducted at the church. 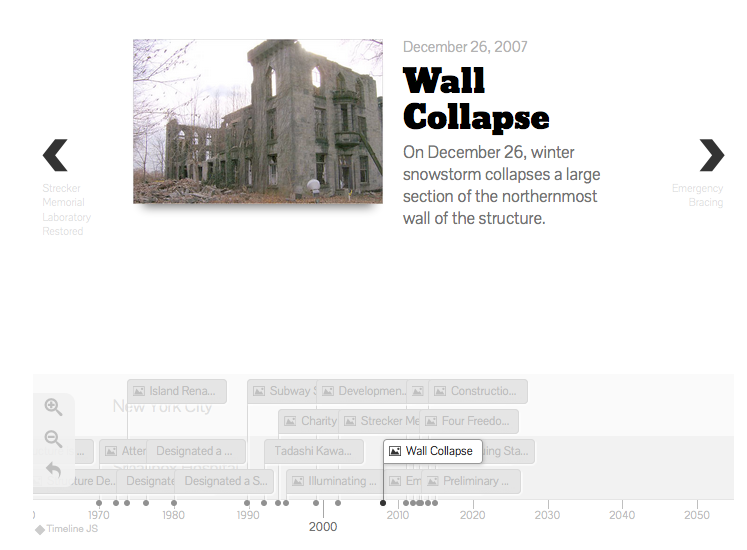 Demolition began three months later." You can read more about the Renwick building in James M. Goode's Capital Losses. This week we launched a new section on our website dedicated to the history of the smallpox virus. Please find it here. As the smallpox virus plays a critical part of world history, we hope to expand this section of our history site over the course of the next months. We also want to take a moment to applaud the good work of the World Health Organization and all they have done to rid the world of this devastating infection. In 1969, Roosevelt Island was called Welfare Island and was a site of prisons, hospitals, like Goldwater, and a penitentiary. The island, with its rich history, was also home to an incredible amount of derelict and vacant structures. In the late 1960s, the Planning and Development Committee of Welfare Island created an official report for New York City Mayor John Lindsay on the island's health. In it, the committee included a copy of this map (digitally updated here) and showed how the island's southern end included twenty buildings, all of them vacant. Structures ranged in purpose from a children's pavilion and an 'old female' dormitory from 1902 and a paint shop from 1850. Only three of these structures exist today: the Smallpox Hospital, the subway vent, and Strecker Laboratory. In 1973, Welfare Island was renamed for Franklin D. Roosevelt and the State devised a plan to redevelop much of it into housing. The land on the island's southern end was untouched for years. Seventeen of the twenty buildings either crumbled or were demolished and island's edges eroded into the East River. In 1976, however, the Smallpox Hospital was designated a New York City Landmark and in 2002 the Strecker Lab was repurposed as a substation for the Metropolitan Transit Authority. In the early 2010s, Southpoint Park and Four Freedoms Park opened to the public. When visiting the two parks and few buildings at the southern end of the island, it is interesting to imagine how crowded the site once was. The New York City Landmarks Preservation Commission is a city agency that oversees Landmarks Preservation law. This set of laws was established by Mayor Robert F. Wagner, Jr. in 1965 to preserve designated buildings and sites of historic, architectural, or cultural importance. On March 23, 1976, the Smallpox Hospital (which, by then, was a ruin) was designated a New York City Landmark by the commission. These four gorgeous black-and-white photograph were taken circa 1976 and were included in the building’s application for designation. Today, we have published the full report, which you can find here. This past weekend, New York City lost a beautiful landmark. The Trinity Chapel, now known as the Serbian Orthodox Cathedral of St. Sava, suffered a devastating fire. The building presently stands in ruin and its future unknown. The chapel was designed by a contemporary of James Renwick, Jr., an architect known as Richard M. Upjohn (1828-1903). The Gothic revival structure opened one year before the Smallpox Hospital and served the community for over 160 years. To remember the building, we publish today three Upjohn drawings from its original construction. Like Renwick, Upjohn had terrific craft and architectural skill. In 1968, the Landmarks Preservation Commission described St. Sava as "an excellent example of the large metropolitan church done in the English Gothic Revival style. It is a pleasing edifice, rugged in character, of substantial construction, and reinforced with large buttresses which give it both durability and permanence." The building had a "special character, special historical and aesthetic interest and value as part of the development, heritage and cultural characteristics of New York City." The building was designated a New York City landmark in 1968 and was added to the National Register of Historic Places in 1982. 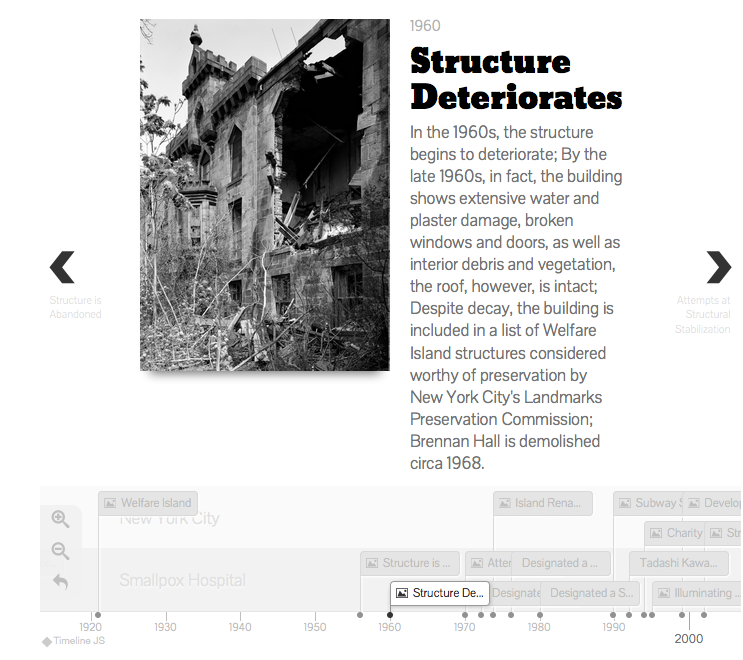 This week we launched a new, illustrated timeline of the Smallpox Hospital. Find it here. 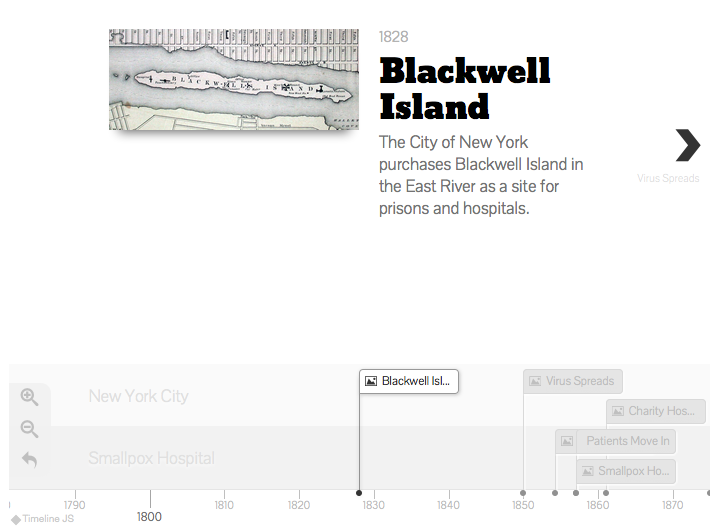 The timeline begins in 1828 with purchase of Blackwell Island (now known as Roosevelt Island) by the City of New York and spans nearly 200 years to the present. It also explores key moments like the death of architect James Renwick, Jr., or when neighboring building such as City Hospital or Strecker Laboratory were constructed, demolished or restored. We hope you enjoy exploring! 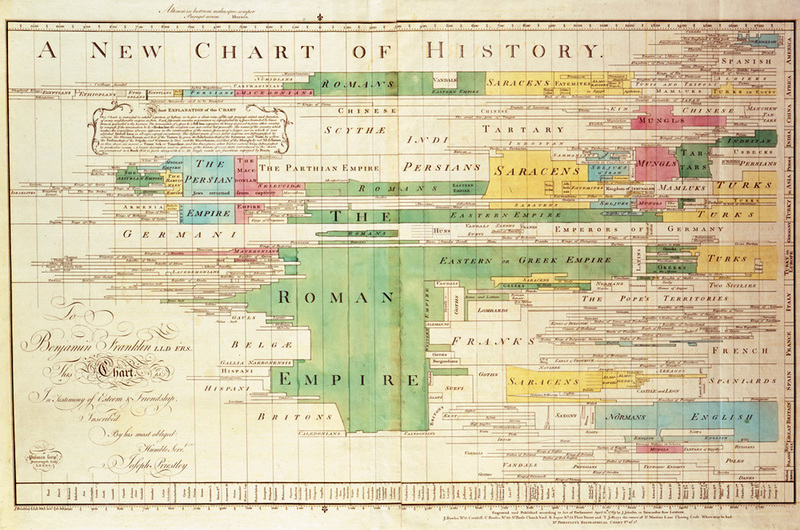 The history of the Smallpox Hospital is not nearly as complicated as Joseph Priestley's A New Chart of History from 1769, but is still fascinating.